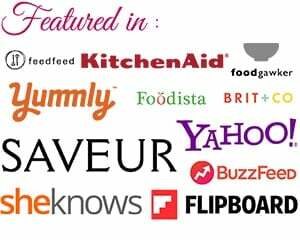 I have many times been asked to share my rice kheer recipe on the blog. I eventually got time to finally make my most favorite Indian dessert. If you are thinking that making chawal ki kheer is a critical task, let me remind biryani is tougher. But yes, knowing the consistency is definitely very important. Rice pudding is not only famous in India but other countries as well. The only difference is the use of vanilla extract instead of saffron or rose water or kewra. Once my cousin was making Indian rice pudding, everything was fine except for the consistency of rice in the milk. The mistake which happened was she used excess rice which turned out to be a “disaster” as she says. 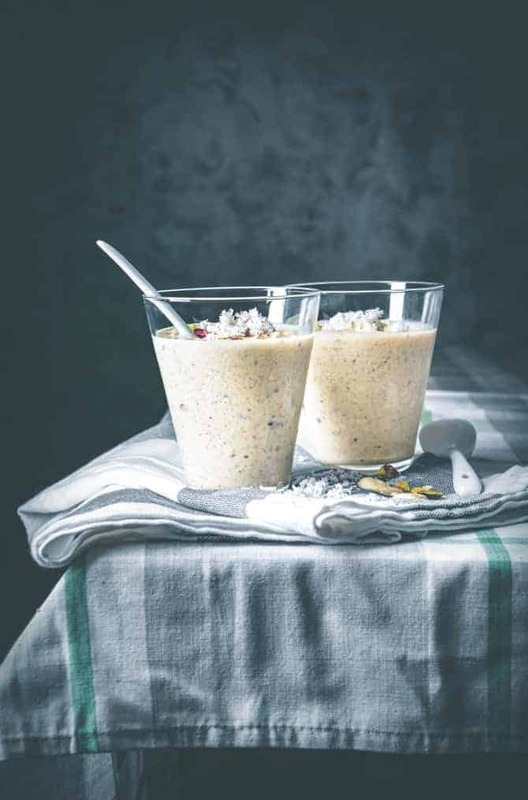 She absolutely had all the ingredients perfectly set for the kheer, but the only thing which was beyond the mind set was the rice. The rice turns too thick if taken more than the actual requirement. And this is exactly what happened with my little sister. 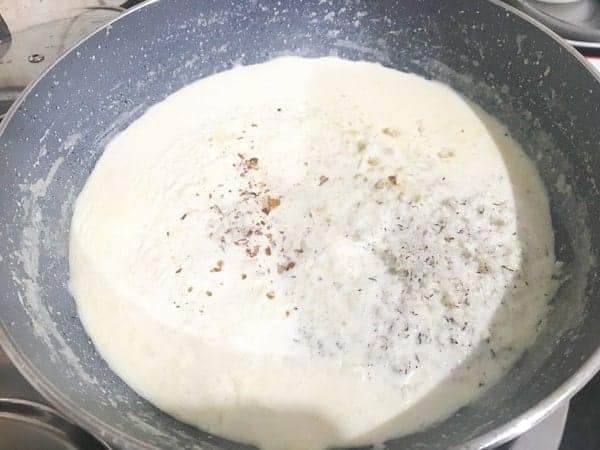 So here is a quick tip, whenever making the best rice kheer recipe, always be very sure and confident about the measurement of your ingredients. You may find making a dessert little impossible, but you need a little effort and there you go with perfect dessert. Take a notepad and list all the ingredients, so that you do not refrain from making a delicious rice pudding for your family. Full fat milk, basmati rice, sugar, grated dried coconut, kewda, elaichi powder, cashew nuts and almonds. These are the only ingredients which I have used in my chawal ki kheer. 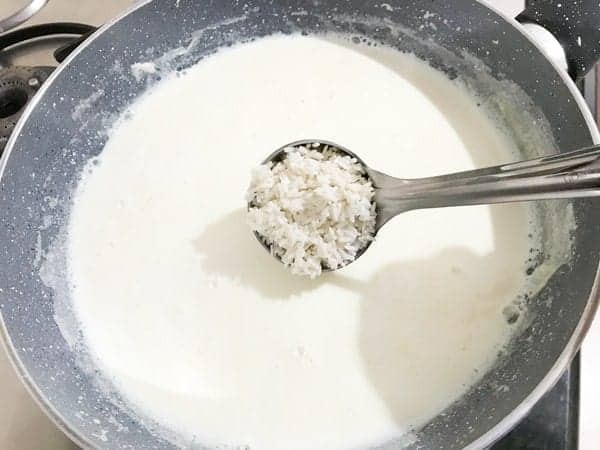 The given recipe below is rice kheer recipe without condensed milk. 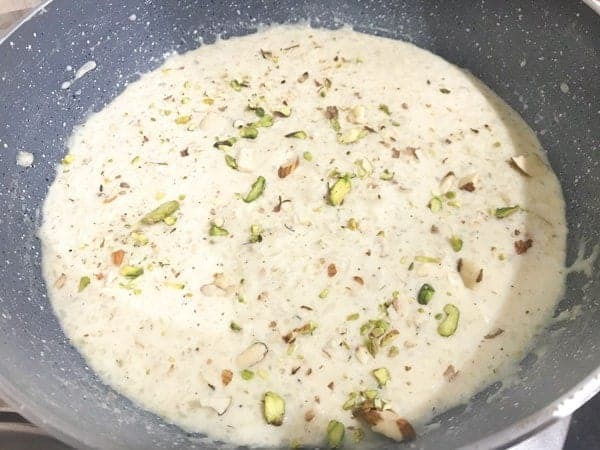 How to make kheer recipe at home? Indian desserts are probably amongst the most loved and demanding delicacy globally. I remember when I visited UAE, there was a separate counter of Indian desserts. And believe me the most flooded counter was the Indian one. Also I got to see few of the desserts getting wiped off immediately. To make kheer recipe, simply we need to boil milk for few minutes. Then add soaked rice and cook until rice is done well. Lastly add sugar, required nuts, and flavouring agents like kewda or rose water along with cardamom powder and you are done. You may add Jaggery also instead of sugar. I would not suggest using honey here as it may not give a prominent taste or flavor desired for an Indian rice kheer recipe. The ingredients for rice kheer recipe with milkmaid are the same as I have mentioned, except for milkmaid. 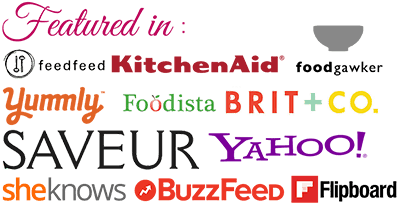 You may add milkmaid or mithai maid or any condensed or powdered milk. You need to then look on to controlling the spoons of sugar to be used. The condensed milk already consists of sugar contents this may make your chawal ki kheer over sweet. A kheer tastes best with its natural flavor and no extra sweetening or flavor makes it natural. 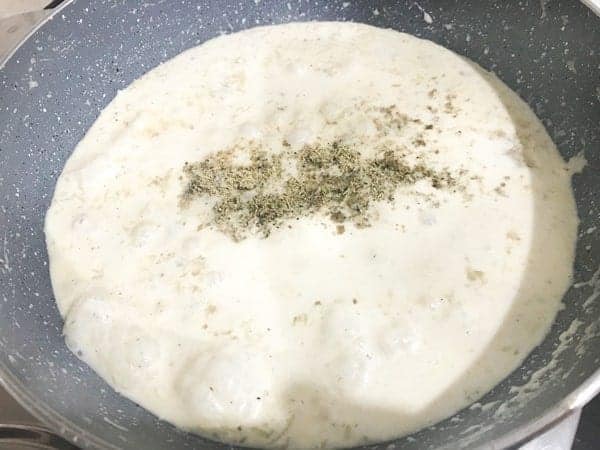 Furthermore, i have used raw rice for the recipe of rice kheer, but sometimes you will see people making kheer using cooked rice or left over rice. Personally, i always prefer using raw rice to make kheer. But, if you want to make it using cooked rice then, add approx 3/4 cup of cooked rice to simmering milk. In this case, be sure to simmer the milk until it is reduce to atleast 3/4 of it quantity, before adding cooked rice. Then add nuts, sugar and simmer until thick. Finaly add cardamom, kewra and mix. 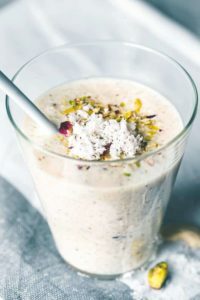 If you wish to make this delicious shahi kheer recipe, that is absolutey easy and tastes super yummy. The only thing you need to do here is either add 1/4 cup of khoya or 1/4 cup of rabdi to the recipe along with a pinch of saffron at the end. Also, skip adding grated coconut for shahi version. 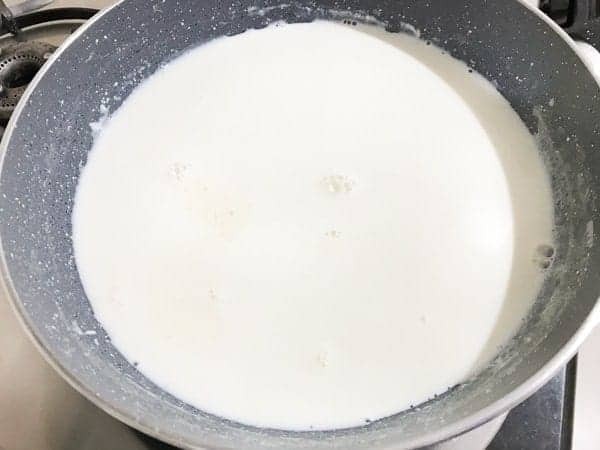 Keep churning the milk while it is on a boil to avoid it from sticking in the bottom of the pan. The milk may smell burnt or not mesmerizing to the tongue. If you do not get kewda essence easily, and if you use or like rose water, you can use a few drops of it. Do not add too much of fragrance, it may lead to disturbing your taste bud. Let us get started by making our delicious and easy Rice Kheer Recipe. Now, add soaked rice, stirring continouosly. Allow the rice and milk to cook together for 12-15 minutes on low heat. Keep stirring in between to avoid burning. TIP : Once the rice cooks well, gently mash the rice with the back of ladle to break the rice garins (you may also use masher). Do not over mash it . However, if you are using broken basmati tukda or short grain rice, then you do not need to do the mashing. But if using long gran grain basmati rice, then do mash it once to get that perfect rice kheer consistency. Finally, add cardamom powder, kewra essence or rosewater and mix, cook for another minute and take it off the heat. Cool the rice kheer completely. Chill for few hours before serving, if you love to have it chilled. If you are serving it as a kheer puri, then you can serve the garnished kheer at room temperature along with hot fluffy puris. If you do not get kewda essence easily, and if you use or like rose water, you can use a few drops of it. Do not add too much of fragrance, it may lead to disturbing your taste buds. Now, add soaked rice, stirring continouosly. 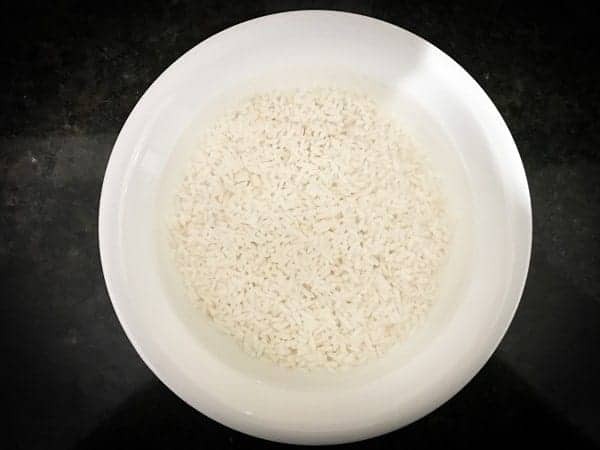 Allow the rice and milk to cook together for 12-15 minutes on low heat. Keep stirring in between to avoid burning. Once the rice cooks well, gently mash the rice with the back of ladle to break the rice garins (you may also use masher). Do not over mash it . However, if you are using broken basmati tukda, then you do not need to do the mashing. But if using long gran grain basmati rice, then do mash it once to get that perfect rice kheer consistency. Cool the rice kheer completely. Chill for few hours before serving, if you love to have it chilled. If you are serving it as a kheer puri, then you can serve the garnished chawal ki kheer at room temperature along with hot fluffy puris.